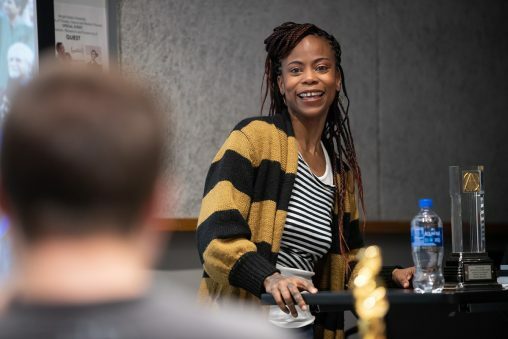 Academy Award-winning Wright State University alumna Hannah Beachler paid an unannounced visit to the campus, toting her shiny gold Oscar and thrilling a class of motion pictures students. 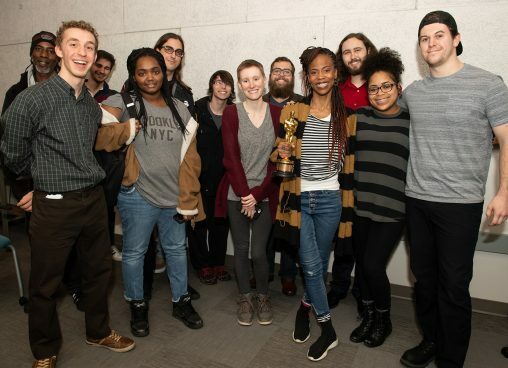 Beachler arrived at the Tom Hanks Center for Motion Pictures on March 15 to speak to about 50 students, who crowded into a classroom after word began circulating that the newly crowned Oscar winner would be there. As she walked up to the classroom door, Beachler revealed the shiny gold statuette, pulling it out of her handbag. “Bringing it home to Wright State,” she said with a victory smile. Beachler, a 2005 graduate of the Wright State Motion Pictures Program, made history when she won an Academy Award in February for her work on the blockbuster film “Black Panther.” She is the first African American to win an Oscar in the Best Production Design category. Beachler, 48, who was named the 2018 Alumna of the Year by the Wright State Alumni Association, said she has great memories of her time at Wright State. “My son riding his Big Wheel up and down the hallway while I edited,” she said. When Beachler walked into the classroom pumping the Oscar over her head, the students erupted into cheers and applause. She spoke for 90 minutes on a wide range of topics to about 50 students, who peppered her with questions. Hannah Beachler is the first African American to win an Oscar in the Best Production Design category. Beachler has agreed to create five scholarships for junior and senior motion pictures students and several scholarships for sophomores as well. Called the Hannah Beachler and Carol Trevino Scholarship, it will be for one year. Beachler dedicated her Oscar to Trevino, of Wilberforce, her Wright State classmate who was killed in an automobile accident while working on a film near Shreveport, Louisiana, in 2007. 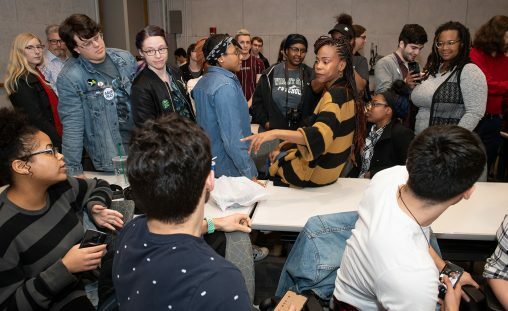 Hannah Beachler has agreed to create a scholarship, named in of her late classmate Carol Trevino, for motion pictures students. Beachler spent 13 months working on Marvel’s “Black Panther,” overseeing a $30 million art budget and a dedicated crew of several hundred people. She was also the production designer on “Moonlight,” which in 2017 won the Academy Award for Best Picture and the Golden Globe Award for Best Drama. She received the 2017 Art Directors Guild Award for excellence in production design and art direction for her work on “Lemonade,” Beyonce’s visual album that originally aired on HBO. Beachler was also the production designer on “Miles Ahead,” a biographical film based on the life of jazz musician Miles Davis; “Creed,” the seventh film in the “Rocky” series; and “Fruitvale Station,” which won the Grand Jury Prize for Best Film and the Audience Award for Best Film at the Sundance Film Festival in 2013.